If you’re tired of horror franchises that were born nasties but grew up to be self-parodies, you’re not alone. Child’s Play creator Don Mancini has seen his iconic Chucky doll mature into a figure of fun, albeit one that mutilates people. One senses he could feel his genre legacy slipping away and consequently, following a 9 year hiatus from Seed of Chucky, we have this late and quite possibly final sequel, that attempts to send the character off with whatever passes for a serial killer’s dignity in tact. Mancini’s crafted a morbidly witty schlocker; a haunted house yarn with enough stalk and slash to placate gore whores, plus a seasoning of jokes for those who’ve come to expect the same. The residents of said abode, designed by the architects responsible for the Bates’ family home, are a dysfunctional sect; the kind of family that endears an audience to a predatory murderer. As movies like Curse of Chucky are designed to stimulate the sociopathic tendencies of patrons, the doll’s prey is suitably grotesque – a mentally infirm tetrapelgic, her spoilt, money grabbing sister, a leering husband and a nubile au pair. That they’re duplicitous and selfish for the most part only makes their fate more assured; a welcome reminder that the horror genre remains the antithesis of all others for one simple reason – it gleefully destroys the institution of family, both figuratively and actually. Little wonder these flicks, when competent and wry, as here, are such a tonic. This may be the last of the mileage in the Chucky series, but it’s a fine dénouement that bunches threads pulled from Tom Holland’s 1988 original. 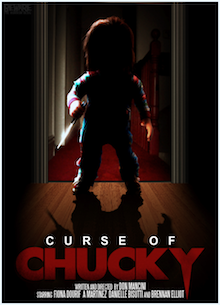 Mancini’s retro approach, eschewing CGI for practical effects, makes Curse of Chucky feel congruous with the shockers of old, while his tongue in cheek screenplay guarantees there’s fun to be had, no matter how unpleasant the underpinning. If the series ends here, and every self-respecting fan of Brad Dourif’s little monster shall will it to be so, then it can be said to have gone out on a high. Mancini’s pared back the laughs and restored much of the dread that made his creation stand out in a crowded field of screen sadists. Perhaps now he can return to his life secure in the knowledge that he’ll be remembered for keeping sensitive children awake at night, soiled in their own filth, rather than making them laugh: the disaster that nearly was. Great movie. I’m a big fan of 1 and 2 this felt more like those movies. This won’t be the end though. Talks of a sequel to this … and a remake of the original have already been publicized.